Model: This is an unpowered dummy unit with a permanently mounted 5-pin coupling on one end of the powered rail car, for extending the motorized diesel powered rail car, item number 37718, to a 2-part or 3-part unit. An additional 5-pin coupling for plugging into the motorized unit is included. There are triple headlights and dual red maker lights only at the non-coupled end of the dummy unit, and they change over with the direction of travel. The coupled end of the dummy unit does not have lighted headlights. The rail car has factory-installed interior lights. The headlights and the interior lighting are maintenance-free, warm white LEDs. The destination displays are prototypically correct with yellow LEDs. The headlights, interior lights, destination displays, and dual red marker lights will work in conventional operation and can be controlled digitally from the motorized unit. The running gear and the body are well detailed and there is a clear view through the windows. The rail car has interior details, and a closed diaphragm and a guide mechanism on the Jakobs truck between the two halves of the unit. Center buffer couplers are represented at the ends of the powered rail car. Total length 48.1 cm / 18-15/16". 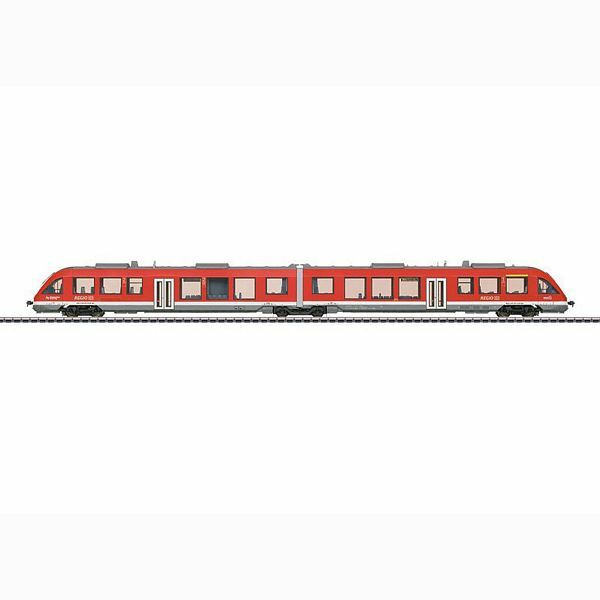 This non-powered dummy unit is the ideal addition to expand the motorized diesel powered rail car, item number 37718, to a prototypical double or multiple unit consist.